I guess Allah will never forgive me"
You should know that Allah has commanded His slaves to repent sincerely and has made doing so obligatory. "O you who believe! Turn to Allah with sincere repentance.. ."
Allah has given us time to repent before the honorable scribes (recording angels) record our deeds. A further respite is granted after the deed has been recorded, up until the moment before death approaches. Major or minor sins....all are disobedience to Allah. Anas said: "You do things which in your eyes are less significant than a hair, but at the time of the Messenger of Allah (peace be upon him), we used to count them as things that could destroy a man." Ibn Masud said: "The believer regards his sin as if he were sitting beneath a mountain which he fears may fall on him, whereas the sinner regards his sin as if a fly lands on his nose and he swipes it away." Will these people then understand the seriousness of the matter when they read the following Hadith of the Prophet (peace be upon him)? "Beware of the minor sins which are often thought of as insignificant, for they are like a group of people who stopped in the bottom of a valley. One of them brought a stick, and another brought a stick, until they had gathered enough to cook their food. These minor sins, if a person is called to account for them, will destroy him." The word Tawbah (repentance) conveys a profound meaning, one which carries great implications. It is not, as many people think, the matter of mere lip-service, after uttering which a person may then continue in his sin. You will see that repentance is something which is over and above seeking for forgiveness. That the sin should be given up only for the sake of Allah, not for any other reason, such as being unable to do it, or being afraid of what people will say. The one who does not commit a sin because of reasons beyond his/her control cannot be described as one who repents. So the liar who is robbed of the power of speech, the adulterer who becomes impotent, the thief who loses her limbs in an accident...all of them must feel remorse for what they have done and give up any wish to do it again. The one who repents should feel that his sin is repulsive and harmful. This means that if a person repents sincerely, he cannot derive any feelings of pleasure or enjoyment when he remembers his past sins, or wish to repeat them in the future. What Should I Do When I Have Sinned ? The first is to feel remorse in ones heart and to be determined not to repeat the sin. This is the result of fearing Allah. The second is to undertake some physical action to do different kinds of good deeds, such as praying Salat at-Tawbah (the prayer of repentance). "There is no man who commits a sin, then gets up, purifies himself, prays two Rakahs then asks Allah to forgive him, but Allah will forgive him.'" Other Sahih reports describe how to perform the two Rakahs which will expiate for sin. 1. He should perform Wudu. "There is no-one who performs Wudu and performs it well, but his sins will fall from the washed limbs with the water or with the last drop of water." 2. Offers two rakaa of Prayers. 3. Does them with full presence of mind and heart. 4. Commits no mistake within the Prayers. 5. Does not speak to himself within them. 6. Recites the prayer-words in them well and in humility. 7. Then seeks Allahs forgiveness. The result will be that his previous sins will be forgiven, and he will be assured of Paradise. This should be followed with more good deeds and acts of obedience to Allah. When Umar realized that he had made the mistake of disagreeing with the Messenger of Allah (peace be upon him) during the Campaign of al-Hudaybiyah, he said: "Because of that I did many deeds," i.e., righteous deeds, as expiation for that sin. So good deeds release the sinner from the prison of disobedience, and bring her forth into the brave new world of obedience to Allah. The Messenger of Allah (peace be upon him) did not say anything, and the man went away. So they brought him back, and (the Prophet (peace be upon him) recited to him: 'And perform al-Salah (prayer) at the two ends of the day and in some hours of the night. "Verily, the good deeds remove the evil deeds (i.e., small sins). That is a reminder for the mindful (those who accept advice)"
Bad friends will curse one another on the Day of Judgment, which is why when you repent, you should keep away from them, shun them, and warn others about them if they do not respond to your Dawah and advice. You should not let Shaytan tempt you to go back to them on the grounds that you want to advise them, especially when you know yourself to be weak and unable to resist this temptation. There are many cases of people falling back into sin because they went back to the company of bad friends. She should destroy the Haram things in her possession, such as alcoholic drinks, musical instruments , Haram pictures and films, worthless literature and statues. She should choose righteous friends who will help her, instead of those bad friends. She should strive to attend gatherings where Allah is remembered and where she may gain more knowledge. She should fill her time with worthwhile pursuits so that Shaytan will not find ways to remind her of the past. She should rebuild her body which has been fed on unlawful things, by obeying Allah and striving to nourish it with only lawful things, so that it will become strong. Will Allah Forgive Me ? The guiding principle for us Muslims is to refer to the Quran and Sunnah when we look for rulings, solutions and remedies. This refers to when the slave meets his Lord in the Hereafter. "'O son of Adam, so long as you call upon Me and put your hope in Me, I will forgive you for what you have done, and I shall not mind. O son of Adam, if your sins were to reach the clouds of the sky, and you were to ask me for forgiveness, I will forgive you and I shall not mind. O son of Adam, if you were to come to Me with sins nearly the size of the earth, and you were to meet Me not associating anything with Me, then I would bring you forgiveness nearly the size of (the earth).'" "There was among the people who came before you a man who killed ninety-nine people. Then he asked about the most knowledgeable person on earth, and was directed to a hermit, so he went to him, told him that he had killed ninety-nine people, and asked if he could be forgiven. So he killed him, thus completing one hundred. Then he asked about the most knowledgeable person on earth and was directed to a scholar. He told him that he had killed one hundred people, and asked whether he could be forgiven. The scholar said, 'Yes, what could possibly come between you and repentance? Go to such-and-such a town, for in it there are people who worship Allah. Go and worship with them, and do not go back to your own town, for it is a bad place." So the man set off, but when he was halfway there, he died . The angel of death came to him, and the angels of mercy and the angels of wrath began to argue over him. The angels of mercy said: He had repented and was seeking Allah. The angels of wrath said: He never did any good thing. An angel in human form came to them, and they asked him to decide the matter. He said: Measure the distance between the two lands (his home town and the town he was headed for), and whichever of the two he is closest to is the one to which he belongs. 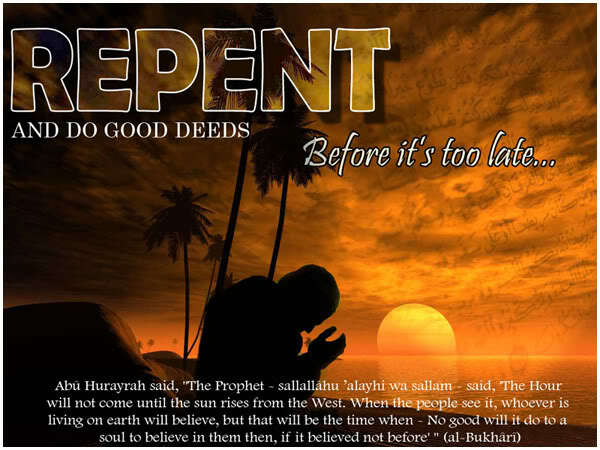 What then can come between a person and repentance? Do you think that your sins are any greater than the sins of this man, whose repentance Allah accepted? So why despair?